Not only is hypothyroidism in men possible, it’s actually more common than expected. Often mistaken as a health problem that only women experience, hypothyroidism in men can develop into a serious problem that negatively impacts men’s quality of life unless treated. You can think of the thyroid like your body’s power plant — critical hormones produced in the thyroid send signals that activate and energize many of the body’s systems. Hypothyroidism occurs when the thyroid, a butterfly-shaped gland located at the base of the neck, underperforms. When it fails to produce sufficient quantities of certain vital hormones and deliver them to your bloodstream, many of your bodily systems will function at a less-than-optimum level, resulting in symptoms that damage your quality of life. Two of our locations, TCT Frisco and TCT Prosper, specialize in treatment for male hypothyroidism. Learn more about our Frisco location. Learn more about our Prosper location. 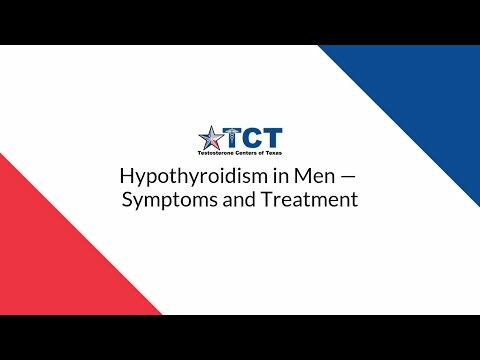 The first step in determining if men are suffering from hypothyroidism is to talk about the symptoms you’re experiencing. At TCT, we listen carefully to you describe your symptoms and investigate fully. Then, we let the lab results confirm or deny what we’re hearing from you. A medical provider who has experience with men suffering from hypothyroidism is going to be familiar with the tell-tale signs of the disease that crop up and hamper your normal daily routine. Thyroid hormones also regulate many organs of the body, and they affect our metabolic rate, which is the reason hypothyroidism can negatively affect both body weight and energy levels. Another symptom commonly associated with hypothyroidism in men is pronounced, severe fatigue, usually within an hour after eating lunch. This period of fatigue can rob you of all of your available energy, stealing the vitality you used to have that made both work and free time productive and enjoyable. Overall, these symptoms range from the unpleasant and undesirable to a serious handicap to your work and family life. If you’re experiencing the symptoms of male hypothyroidism, we want you to know that it’s far more common than people assume (and that help is available). The next step in diagnosing hypothyroidism is blood testing that seeks to confirm or negate the suspicions that the patient interview process revealed. Many initial, exploratory blood tests simply take a high-level view of the situation, with the hopes of seeing some indication of a problem. These tests are notorious for failing to catch the actual indicators of hypothyroidism. These very general lab tests are looking primarily at TSH (thyroid stimulating hormone), which can be a very good indicator of an existing thyroid problem — but not always. When this number comes back within a normal range, most medical practitioners consider that an “all clear” signal that the thyroid is normal. At TCT, we insist on going further by checking 2 other very important hormones produced in the thyroid called free T3 (triiodothyronine) and free T4 (thyroxine). These make up less than 1% of the total hormone production of the thyroid, but they are the hormones your body most relies upon to function properly. Much of T3 and T4 produced by the thyroid bind to proteins and are not available to be utilized by the body. However, small amounts remain “free” in the bloodstream to be utilized by the body to power it’s systems. Low levels of “free” or “active” T3 and T4 are what lead to the symptoms of hypothyroidism in both men and women. Looking at the TSH levels in addition to free T3 and T4 gives our treatment experts the necessary data to support or disregard our initial hypothesis formed from carefully diagnosing your symptoms — we make a final diagnosis from a very complete picture of your health situation. To put this another way, a diagnosis of hypothyroidism is made by, first, listening carefully to a patient describe their symptoms, and then carefully examining the blood test results in order confirm or rule out the often hard-to-detect case of male hypothyroidism — symptoms first, data second. In most cases, we cannot make your body produce more of a needed hormone. Much like treating low testosterone, hypothyroidism is treated by replacing or supplementing the deficient T3 or T4 hormones with a synthetic hormone medication to bring levels up and then keep them within an optimal range. The usual approach to replacement therapy practiced by the medical community at large is, unfortunately, off target. Hypothyroid replacement therapy is commonly treated with a synthetic version of T4 that’s called Synthroid (Levothyroxine). However, to be utilized by the body, T4 must be converted into T3. By only supplementing T4 through Synthroid, the patient’s body must successfully convert T4 into T3. Unfortunately, that critically important link is often broken or sluggish, which results in continuing low levels of free T3 and the development of hypothyroidism symptoms (despite blood test results that show everything should be fine). You can administer synthetic T3 through a medication called Cytomel, which does not depend on the possibly unreliable conversion from T4. However we prefer natural dessicated thyroid medications like Armour Thyroid. It provides a naturally sourced balance of T3 and T4, together in one pill. This medication produces far more reliable results when we seek to both raise and stabilize your thyroid hormone balance. As your body adjusts to your personalized treatment program, your brain will recognize that your body has the necessary levels of thyroid hormones. Your brain will reduce production of TSH in response to those normalized levels, which tells your body to decrease the natural production of thyroid hormones. We continue to carefully monitor the changes and fluctuations in thyroid hormone levels to keep you within a stable, optimum range. More importantly, we continue to monitor any lingering or reoccurring symptoms and make adjustments accordingly. The most pronounced improvement you can expect from hormone replacement therapy for hypothyroidism is a marked improvement in energy levels — relief from that debilitating symptom that probably inspired you to seek treatment in the first place. Again, our most important goal is keeping you symptom-free and feeling your best, not achieving a somewhat arbitrary number on a blood test. If you’re suffering from hypothyroidism, it’s entirely possible that the chain of necessary hormonal signals to produce testosterone also has been broken at its source. Proper functioning of the thyroid and sufficient levels of T3 are required to stimulate the hypothalamus to produce GnRH (gonadotropin-releasing hormone), which then signals the pituitary gland to produce LH (luteinizing hormone). LH tells your testes to produce testosterone. The result of a breakdown in this process is called chronic Low T, or low testosterone. Hormone imbalance issues are complicated. We recommend taking the first step towards feeling better by getting a thorough examination that focuses on finding the actual source of your symptoms.